For the 1991 generation, Grégory Halin's international youth basketball preparation is noting new. He coached this age group to Gold in 2007 at U16 and then to Silver in 2009 at U18 level. Seeing Margaux Okou Zouzouo and Linda Bousbaa (from left to right) working on the statistics and Marion Arfelis filming the game should not have come as a surprise. All three players were part of the 2007 U16 winning team. The French U20 training team have been in camp since 30 May 30 at the "Centre Omnisports Base de plein-air du Temple-sur-Lot". The French and British Federation had agreed to play one test match and two official international youth basketball matches to end this phase of the national preparation. This is the first time since the creation of the U20 European Championships in 2000 that the two countries meet in a test match. 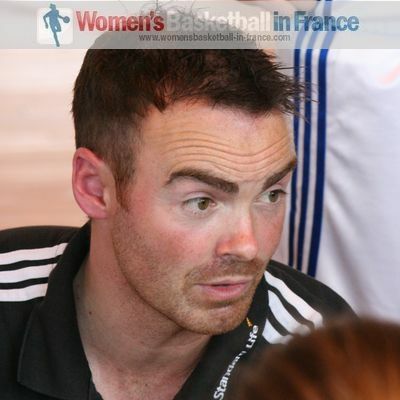 Damian Jennings, the coach of Great Britain, has also experienced winning a Youth International European Championship when his team won promotion in 2010. The first ten minutes of the game were lively with both teams trying to find their feet. However with both coaches turning their bench of youth basketball players it was almost impossible for either team to establish control. Grégory Halin (left) was not too happy and called a time-out. He patiently explained what he wanted his players to do. He basically asked them to stop Great Britain from scoring. France gained the upper hand to edge the first quarter (18-14). 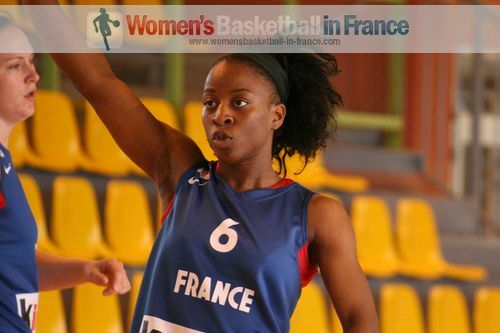 France maintained the pressure while stepping up defensively during the second quarter. They dominated all the sectors of the game for the last six minutes of the quarter while keeping Great Britain scoreless. Princesse Goubou, Touty Gandega and Elodie Dubasque caused mayhem with their speed while Chloé Westelynck was deadly from beyond the arc. Kekelly Elanga and Stéphanie Dufour made sure that the British inside players could not see the ball as they went into the interval leading (38-22). Damian Jennings (right) changed things around for Great Britain after the break and France started having problems scoring. Both teams missed a lot of easy opportunities as defense became the order of the game. All of a sudden the Great Britain players were winning the duels and were scoring. France still had a comfortable lead going into the final quarter (49-30). Despite the support from the local children France were unable to raise their game but still won the game (55-42). The first official international youth basketball game between the two sides takes place on Friday, 10 June 2011. Après un premier quart serré (18-14), les Françaises commençaient à mieux défendre et à jouer plus physiquement en bien alternant le jeu extérieur - intérieur. La vitesse des meneuses Princesse Goubou (photo), Touty Gandega et Elodie Dubasque faisaient leurs effets. Les Britanniques étaient submergées par le jeu de leurs adversaires et les shoots prime de Chloé Westelynck. Ainsi les Françaises avaient pris le large parce que les Britanniques n'avaient pas réussi de marquer. La deuxième mi-temps était une autre affaire avec les Françaises marquant plus. Pourtant les Britanniques - après 10 minutes de faillite en points - finissaient plus fortes. Les deux entraineurs continuaient de tourner leurs effectifs. Pour la première fois, les Françaises avaient de difficultés de marquer. Mais leur avantage en points leur permettait de gagner leur premier match de préparation (55-42). Le 10 juin 2011 à 20h, les Espoirs féminines de France joueront leur premier match officiel contre la Grande Bretagne.